Citric Acid, Natural & Artificial Flavors, Silicon Dioxide, Sucralose, Malic Acid, Acesulfame Potassium, FD&C Red #40. At the recommended 2 scoops per day, XTEND Ripped builds on the clinically studied XTEND formula that promotes lean mass, muscle strength, and fat loss. XTEND Ripped is a revolutionary cutting formula that promotes lean muscle growth, while packing in ingredients like CLA and Capsimax to help enhance fat loss. 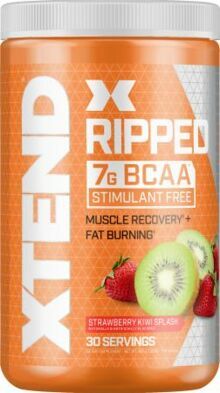 XTEND Ripped is the perfect intra-workout weight loss supplement to help you beat goals and start achieving that completely shredded look you’ve been going after.